Organic growers are split into two camps under federal rules. 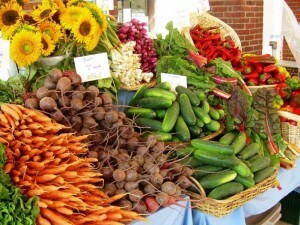 Certified organic growers must undergo an annual inspection of organic farm plans and practices by a certifying agency. These growers can use the U.S. Department of Agriculture’s certified organic label on products. The other camp includes growers who sell less than $5,000 a year in products. They also can use the term organic in marketing products but don’t have to go through the certification process. Those vendors are expected to follow the same practices as certified growers. “They can market it as organic; say it’s organic; but without being certified, they can’t use the seal.” said Sam Jones-Ellard, representative of the USDA’s Agricultural Marketing Service. “Of course farmers’ markets present a unique situation since a lot of those operations are going to be exempt,” he said. Nationwide, farmers markets have been growing in recent years, with nearly 8,300 listed in the U.S. Department of Agriculture’s National Farmers Market Directory. That’s a 76 percent increase in markets since 2008, according to the agency. Read the full story via Organic education efforts continue as farmers markets grow.